« Jim Thompson : The Killer, or not? It’s a dirty job, but somebody’s got to do it. 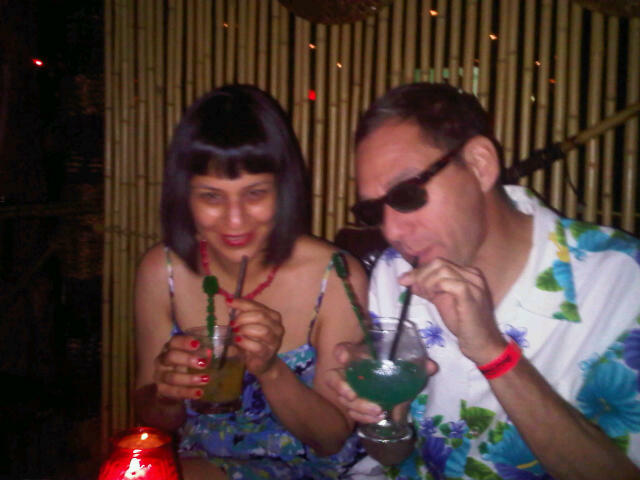 I went to 5 tiki bars on my recent trip to the USA (and visited my two favorites twice). This inspired me to compare their qualities. I like a good drink, good décor and a fun time. Here are a few (very subjective) notes, for what it’s worth. There are many websites where you can get the opinions of tiki “connoisseurs”; some of them get a little too picky. Critiki is quite well-thought-out and has a clever tiki radar feature (“nearest tiki”) that shows the next nearest bars to the one you selected. Frankie’s Tiki Room (Las Vegas): rather sweet drinks, open 24 hours, not very expensive, best room layout, excellent décor, smoking allowed!!! Tiki Ti (LA): fun, family-run, historic, truly historic décor, tiny (and sometimes packed), very good drinks, connoisseur-friendly, smoking allowed!!! inside!!! yes, in California!! !